I still remember back in my keyboarding (IT) class at highschool, when we had to create #PowerPoint presentations using the Microsoft Suite to today when I am working with either a) clients or b) students in the classroom. PowerPoint has changed in that time (overall look and feel) but the concept is still very much there. It is the art of storytelling.. 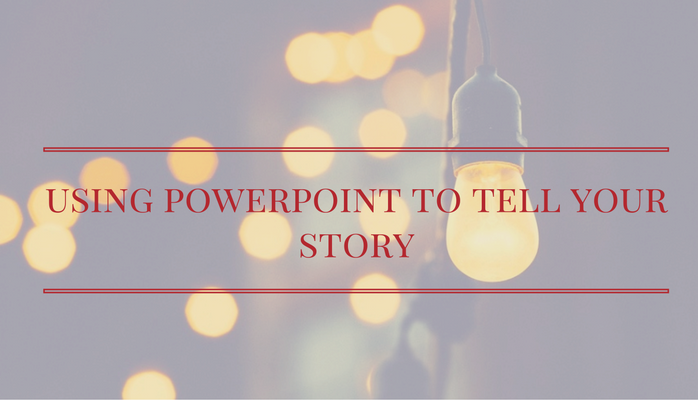 I have found a great article with some infographics about the power of storytelling (using #Tech) – wise advice when presenting to an audience. 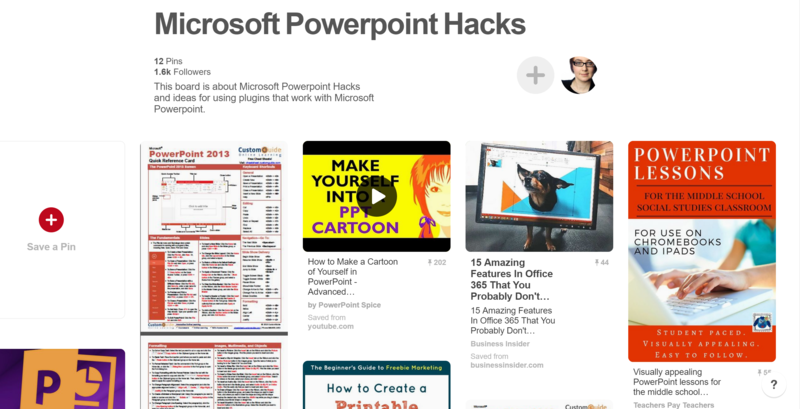 I have also set up a Pinterest board with ideas, shortcuts and tips for getting back to basics with #PowerPoint. This is a really good website that uses PowerPoint to design personalised and branded #Pinterest covers so that it’s consistent with your brand. PowerPoint is available for both Windows, Mac and for mobile devices – iOS, Android and Microsoft products. It is also available online (as a Chrome extension) as well as part of the Office 365 suite. 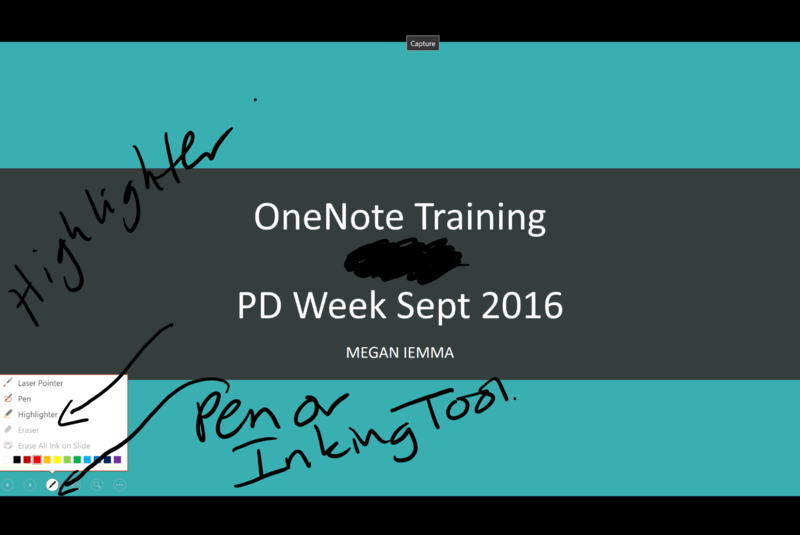 Recently, for my school, I had to deliver a PowerPoint presentation to my colleagues on #OneNote. Our school has gone down the path of Office365 for Education, so I was able to share my PowerPoint with colleagues and then they were able to edit the document and add comments. Did you know you can embed YouTube Videos into PowerPoint? The ability to insert online video directly with an EMBED code or from YouTube (or even Facebook) makes creating presentations much easier. 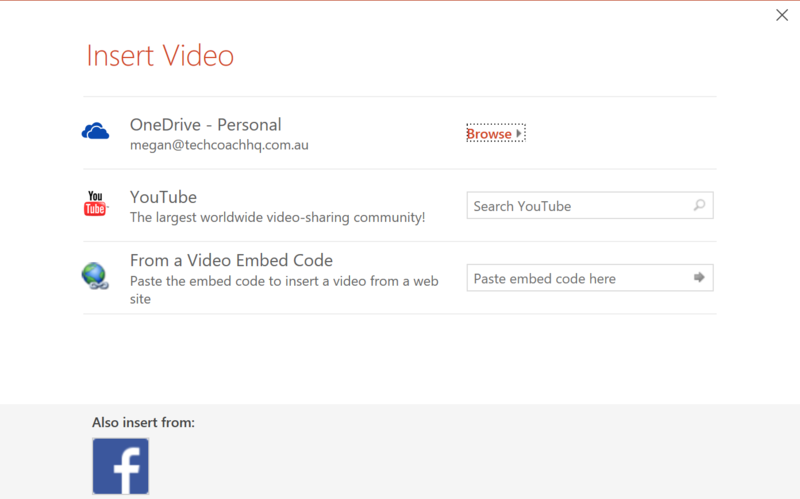 Go to the INSERT ribbon in PowerPoint – Media > Video > Online Video to get your various options for inserting video. Thanks to Brett Gilbertson and some training from Tablet PC I was using my Surface Pro 4 to annotate my PowerPoint presentations. Just by having a blank slide or a slide with a title and then using my Surface Pro 4 pen to annotate while delivering the presentation made a difference. Just remember that when you save the presentation, you will be saving the presentation with the #inking (annotations). Use Shift+F5 – This will play your presentation from the CURRENT slide. This will make your presentation go a lot smoother. Another great tip is to use ‘Master Slide Masters’ – any time you’re doing a large volume of slides (like a training course, less applicable for TED talk-style short decks), the time you invest up front in your template will pay off later. It is often easier to format the Master template than to format within an individual slide. This last tip is very handy – if you want to move to another slide when presenting, just type the slide number and hit Enter. It will take you straight to that slide (eg typing 1-Enter takes you to first slide; 10-Enter takes you to slide 10). Thanks to the team at Microsoft (via Yammer) for sharing these amazing tips. We have been recommending various shortcuts to use with each of the Microsoft Office products during this blog series. Display a blank black slide or return to the presentation from a blank black slide: B or . To show expose every possible #keyboard shortcut, use ALT + H which will display the ribbon and all the shortcuts. Tip: Here are some great shortcuts to use DURING your PowerPoint Presentation.